Making top ten by Olivia Whitelaw! Sorry to have been so quiet lately, but I have been studying hard for my first GCSE, so I’m trying to balance schoolwork and riding. 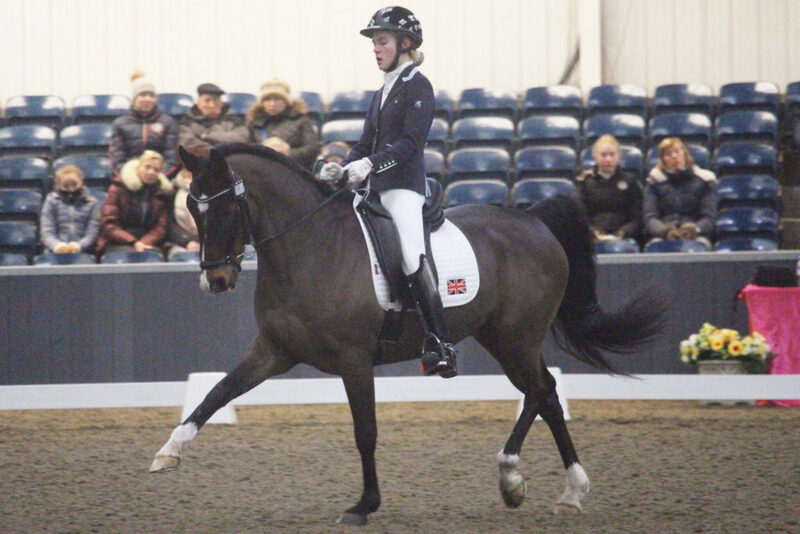 To bring you up to date, Keysoe CDI was a truly amazing experience and one which Leo found very exciting – a little too exciting at times! So I never ever thought in our first International show that we would make two top ten prize givings! Whilst Leo found the cerise pink silk tablecloths on the judges tables completely terrifying, despite this he still delivered some very great work and delivered 8th place in both the Team Test and in the Kur Dressage to Music. Thanks to the Dengie team for coming to support us. Then came our annual trip up to the North West to Myerscough College Premier League. After a journey that never seemed to end, some five and a quarter hours later we finally arrived. I was delighted to see our work in training on Leo’s throughness and his walk pay off with some consistently good scores in these areas. Unfortunately Leo spooked at someone in the canteen and managed to get his tongue over the bit, so we were quite rightly penalised by the judges for around five movements before he managed to get his tongue back under the bit. Therefore to finish in 6th place, with just shy of a score of 69% from a top International judge despite our issues was I felt real progress from which we can continue to build. Leo’s wishes came true on our return to find the Easter Bunny Pony had left him some of his favourite Dengie Grass Pellets in his stable for his return, so he was tired from travelling but happy! 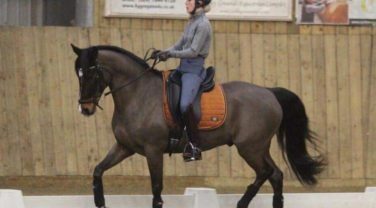 Next up was Keysoe Premier League, can you believe it but we delivered in my mind his best Team Test to date and scored a huge 72.18% from one judge with them having us in 1st place. We scored 69.4% overall and went into 4th place, literally just behind three proven European Ponies and with easy to fix mistakes too. Suffice to say I am very happy with Leo at the moment! Next up is my first GCSE, so Leo’s getting a few days off in the sunshine much to his delight. Then next weekend we are off to one of my favourite shows, Somerford Premier League. It’s a show with a really big atmosphere, so it will be interesting to see how Leo handles this with the marquees and tiered seating etc too. We will let you know how we all get on! After some downs, there's the ups! Sometimes horses just let you down and sometimes they are just super stars! 7 minutes in the whole of January that was all he really had to behave for...7 minutes...sadly Leo picked those 7 minutes to show everyone his moves none of which were in the test sheet!